I hope you may be inspired to embark on your own pilgrimage some day! Day 1 on the Camino de Santiago. Day 2 on the Camino de Santiago. Day 3 on the Camino de Santiago. Day 4 on the Camino de Santiago. Day 5 on the Camino de Santiago. Day 6 on the Camino de Santiago. Day 7 on the Camino de Santiago. Day 8 on the Camino de Santiago. 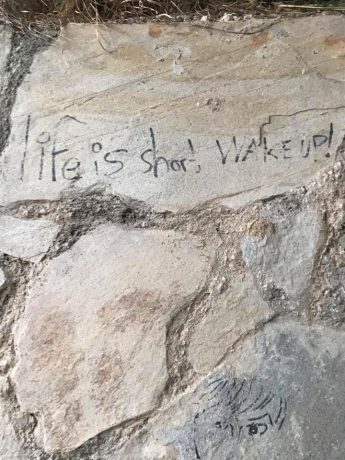 Day 9 on the Camino de Santiago. 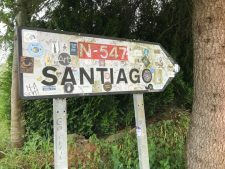 Day 10 – Our Last Day – on the Camino de Santiago. This is a couple of days late because we’ve been celebrating. Also, I think it’s hard to articulate what I was, and am feeling, post-pilgrimage. I’m feeling a lot, and it will take some time to unpack and process. But for now, to keep up with my travel blogging, here’s a Day 10 (and final) pilgrimage report. Greetings from Santiago, and the Cathedral of Santiago de Compostela. 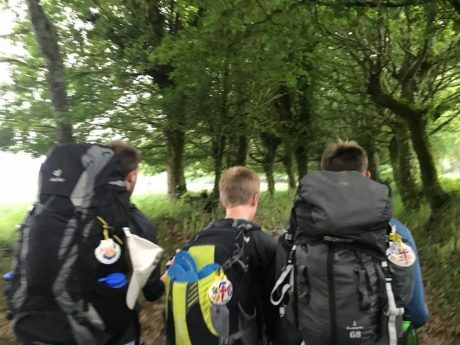 Even though one’s emotions can feel mixed when you reach the end of such a meaningful experience, it was certain that we were all ready to stop walking, and to wear something other than hiking clothes! We hit the trail early again, and had a couple of miles without many other pilgrims on the trail. 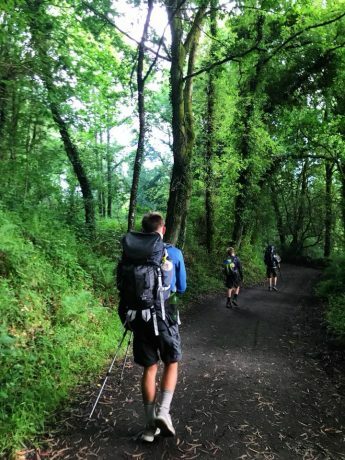 But with about 9 miles left to go to Santiago de Compostela, it was like someone opened a gate and pilgrims entered the trail seemingly out of nowhere. It was an amazing experience, though, to be sharing “The Way” with so many pilgrims. All of us had self selected to do a pilgrimage, and the air was rich with a shared meaningfulness. We all walked with purpose. It was a great procession. The boys hiked hard and fast. They didn’t request as many snacks today as they have the last 9 days, and Jerry and I stayed right on their heels. We were all eager to reach Santiago de Compostela. 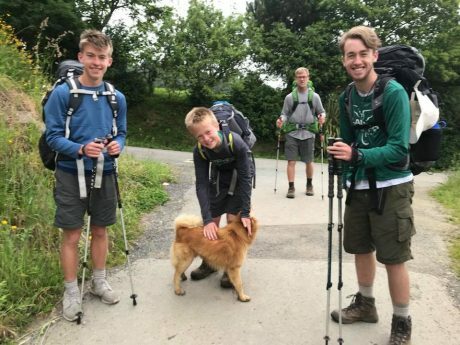 After 10 days of walking on the Camino, we got to know the familiar faces of the many pilgrims who were on a similar timeline and schedule. A kinship was formed, and we often greeted each other at lunch or on the trail, or in the village or town at dinner each evening. It was fun to share in each other’s anticipation of the grand finale today. I only met and conversed with one pilgrim today, but it was a good one. Meeting Gisele today was something I think God, or the Universe facilitated. We were hiking up a big, long hill at about 10am, when I passed Gisele. I smiled, and said the customary “Buen Camino” to her. She smiled and returned the pleasantry, and added, “Are those your boys up ahead? Is that your family?” Yes I told her, and she complimented me, saying “It is beautiful to see your family out here. How wonderful.” We walked and talked for most of the uphill, and a little more. Gisele is originally from Columbia, but has been living in Miami for 23 years. She told me she used to be a nanny for three boys, and seeing my sons reminded her of those boys and that experience. She shared that she owns a few properties in Miami, which she manages, and she recently quit a job where she worked with about 150 people. 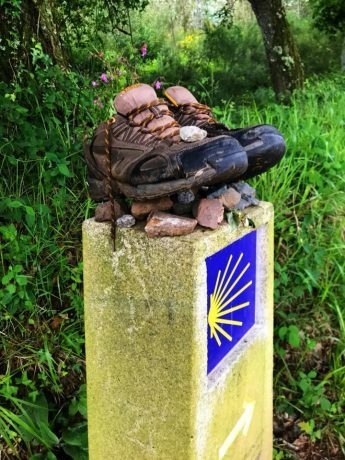 She has been walking the Camino for 6 weeks. I asked her what drew her to the Camino. She said one day she just realized she was racing. Every day felt like a race, and all around her at work, people were “like robots.” She said she, and all of the people she worked with/around came to work every day and they worked fast and furiously, often with headphones on or staring at their computers, and often not even looking at or seeing each other. She added before she knew it another day had gone by. She explained, “One day I just decided I needed to stop. I just needed to stop my life. Every day was so busy and about doing as much as possible and the pace was so fast, I just needed to stop.” She said she also hoped to be closer to God. 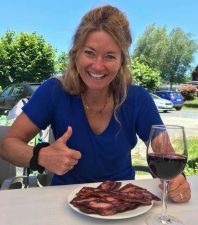 Next thing she knew she was walking the 720-kilometer/500-mile Camino de Santiago. I asked her if her experience on the Camino has been successful in helping her to stop time. “Yes!” she exclaimed. She explained that her days have been reduced to literally just putting one foot in front of the other. Every day. 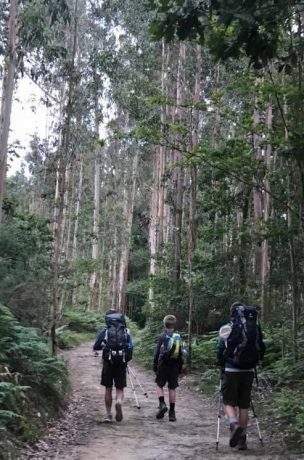 She shared how when she started, it took her 10 hours to climb the mountain on the first stage, and she questioned her decision to walk the Camino. She said she has met so many wonderful people, and heard and experienced so many interesting and personal stories during the journey. About halfway through her experience –in the middle of her 500-mile pilgrimage– she was walking along the path when a shepherd crossed the road right in front of her with about 500 sheep. She said she, and other pilgrims, had to stop in the road and wait and watch as the shepherd herded the sheep across the road. She explained that right in front of her on the road, one of the sheep in the back collapsed, falling right in front of her. “It looked at me with its brown eyes. It was dying.” She said one of the other pilgrims who saw it, chased down the shepherd and told her about the fallen sheep. The shepherd came back to see what was wrong, and looked at Gisele, and explained, kindly, “Death is part of life.” The sheep died right in front of Gisele. 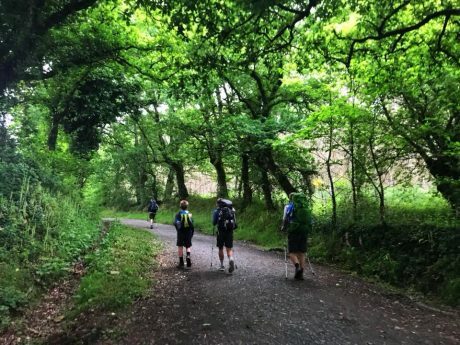 Gisele also told me about a 94-year-old French woman she met who started walking the 500-mile Camino de Santiago in early April, and who is still walking, behind her, somewhere along Camino. “I said to her, ‘Gosh! How do you do it? How do you walk for so long, and at your age?’ And she told me, ‘What do you think I should do? Sit in a chair and knit? 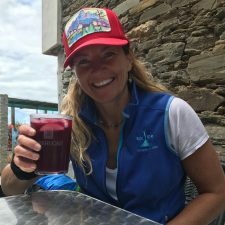 I would rather walk on a trail in France and Spain that sit in a chair and knit.’” Gisele shared how that inspired her to continue her own walk, and how to live her life upon her return. I am so glad I met Gisele. Jerry, who was walking near us, took a photo of us that Gisele asked me to send her, so I will be in touch with Gisele again. 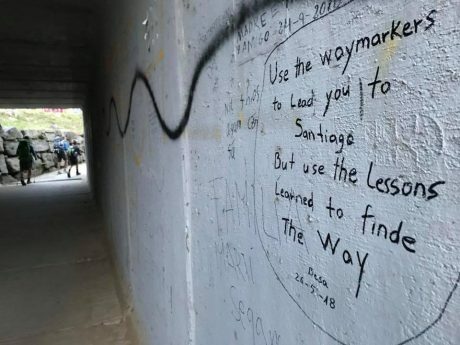 We eventually entered Santiago, and I would be lying if I didn’t report that we were disappointed when we viewed a street map that indicated we still had about 1-1/2 miles to walk (through the city) to get to our final destination! About a quarter-mile before arriving, Wolf offered to hold my hand, and we walked for some blocks that way, before he traded my hand to Hayden, who I walked with for a some blocks, before he gave my hand to Fin, who I walked some blocks with. Then, eventually Jerry! We practically ran into the great plaza where the great Cathedral is located. Yes, I cried. I was overcome with emotion, mostly gratitude. It was a most fulfilling experience, and it was even more meaningful than I imagined it would be. One last thing, though… Most people really are wonderful. All of the people we met or greeted or were greeted by in our 10 days on of pilgrimage were wonderful. We made so many new acquaintances and friends. Two couples from Cincinnati became our fast friends as we saw them often at dinner along The Way, and ran into them one final time on our last night in Santiago last night. We’ll be keeping in touch. What neat people they are. We also reunited with Amy, from CA, who I look forward to keeping in touch with. As soon as I met her, I knew she was my people. I look forward to keeping in touch with her and hopefully finding a way to make our paths cross again one day. And also, we ran into Jorian, from Holland! I had shared her story in an earlier post. 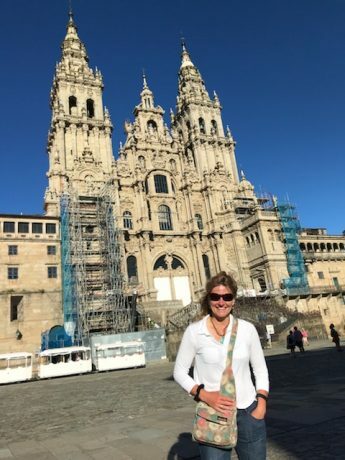 A day before us, she completed the entire Camino and had celebrated the end when she was met by her Father, who flew to Santiago for the occasion. We had big hugs, and it’s a real possibility that we’ll do some work together in the future. We also made friends with Peggy and Ian, a retired couple from Vancouver. 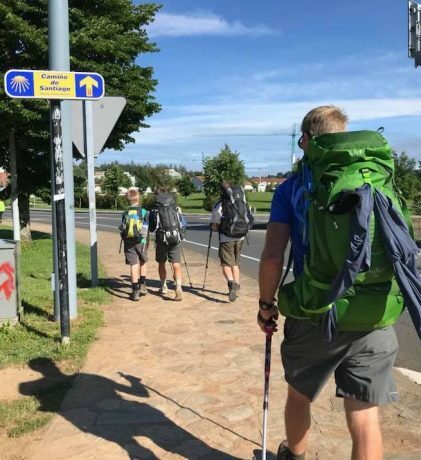 They walked the entire Camino in just 29 days. 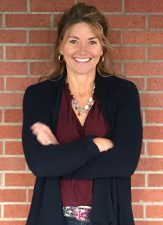 It was something Peggy said she always wanted to do, and when her brother passed away last year and left bucket list items unchecked, it inspired her to not hesitate. 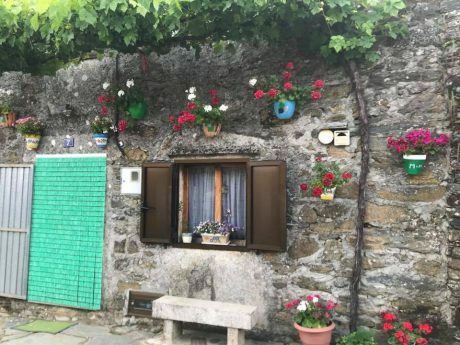 Given the ambitious schedule they kept, they have 7 days to “spare”—and we again bumped into them on yesterday’s Muxia and Finisterre bus tour. Next up –and last stop on our Epic trip itinerary: Barcelona. A rare moment on our final walk with no other people in it. 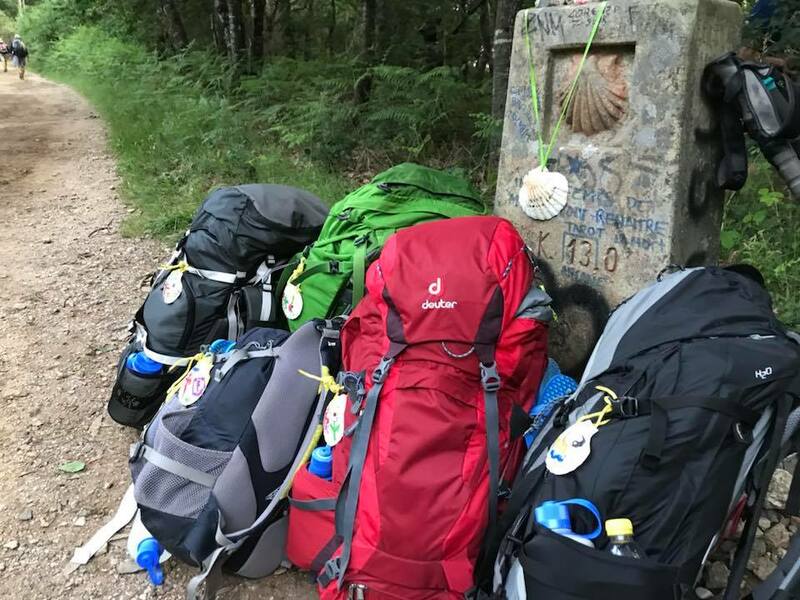 Our backpacks, with their personalized scallop shells attached to them, by one of the final Camino markers on our pilgrimage. 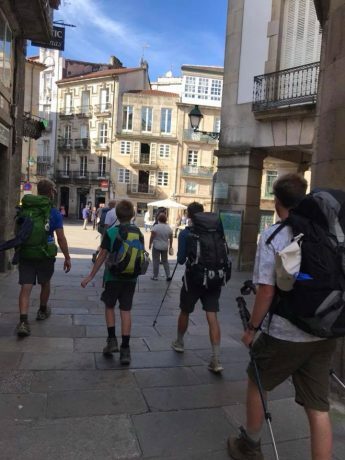 Once we reached Santiago, we had to walk through the city for about a mile and a half to reach our destination-Santiago de Compostela and the Cathedral. Getting closer and closer… We were almost running at this point. Yeehaw! We made it! Posing with our official compostelas and our stamped credencials in hand. 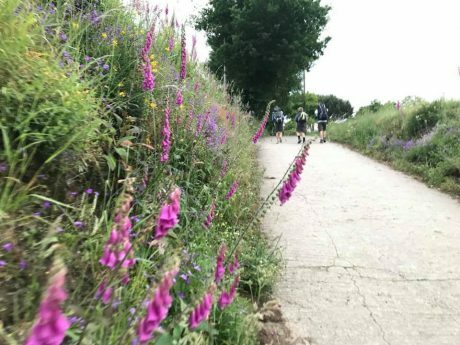 Our pilgrimage on the Camino de Santiago was 260 kilomenters/161 miles. 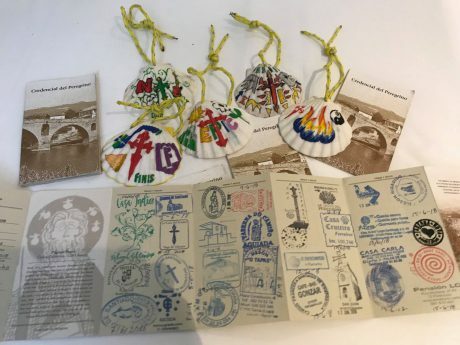 Our painted scallop shells from our packs, along with our “Credencials” with all the stamps we collected along our journey. Day 4 of the Camino de Santiago. I am so proud of the boys. And Jerry, too. But this was Jerry’s and my idea. It wasn’t the boys’ idea… This Osho quote came to mind to me today: “The moment a child is born, the mother is also born. She never existed before. The woman existed, but the mother, never.” For most of this pilgrimage I have walked behind our sons, but almost always with them in my sight, even if from from a distance, and for thousands and thousands of steps, I’ve reflected on my life as a mother – their mother. 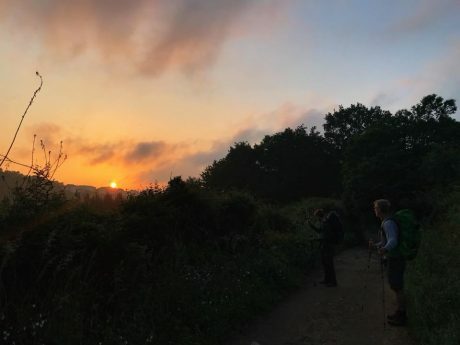 Our waking and starting early again allowed us some solitude on the Camino for a couple of hours today, but by the time we had only a few miles remaining, the trail was pretty full of pilgrims. One of the things that has been confirmed for us on this pilgrimage is that Most People are Wonderful. So far every pilgrim we have met or exchanged a “Buen Camino” with (and there have been hundreds by now) has been wonderful. Today we met Andrew, from Germany. He is the mayor of a small town in the Bavarian Alps of Germany. 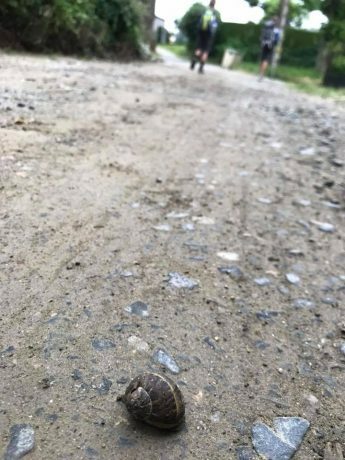 He is on Day 14 of his pilgrimage. 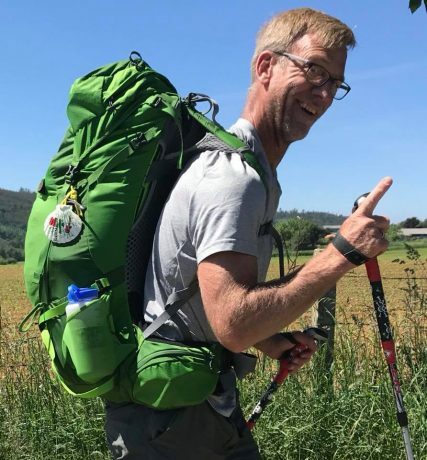 He started on the “Primitivo” route, and joined up with The French Way a couple of days ago. When I explained we are from “Wyoming–near Yellowstone Park,” he said, “I’ve been there! 25 years ago I went there to climb El Capitan.” 🙂 Andrew is an avid trekker and skier and wanted to do a pilgrimage-related trek. 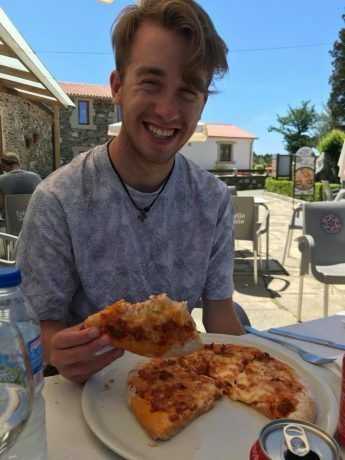 He said his Camino experience has been most wonderful due to all of the interesting and wonderful people he’s met from all over the world. We walked with him for a mile or so. I bet he’s a great mayor! 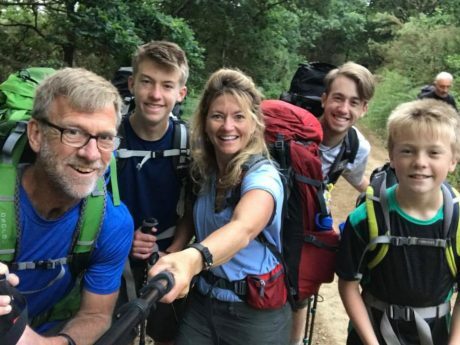 We also met Amy, from Santa Rosa, CA, who is here to support and walk with a friend as he completes the final miles of his 500-mile pilgrimage to Santiago. Amy asked to get a photo with our Fin, since she has a son who is his age and who may return to do the Camino with her on a bike sometime. 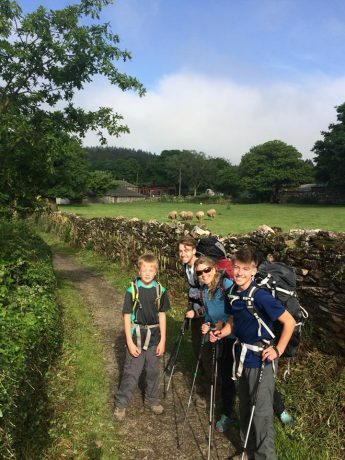 Amy shared with us a few of the lessons she has learned during her time on the Camino, saying the biggest one is that you can be strong and independent and capable and yet still ask for help. I of course really appreciated her sharing this, as that particular lesson seems to be a lesson I’m personally learning over and over – that asking for help isn’t a sign of weakness. 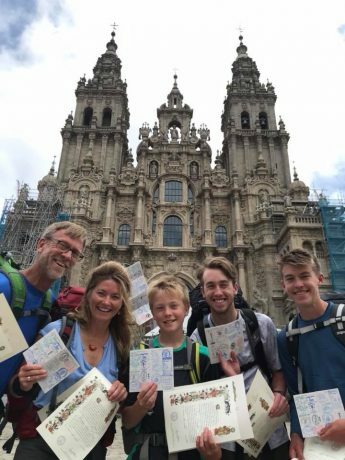 It was another wonderful and unforgettable day on the Camino de Santiago for our family. Tomorrow we will reach the end, and I know for me it will be filled with emotions. We really appreciate your thoughts and following along with us. The boys be like, “Meh.” This photo was captured right before leaving our flat this morning to walk. 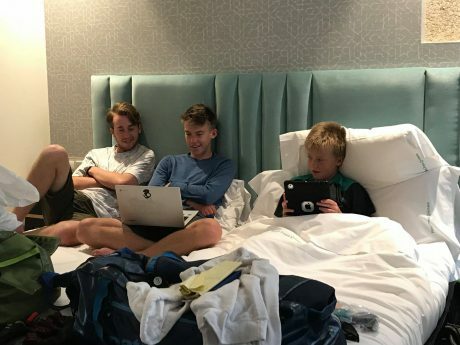 Wolf, our early riser, is half awake, and Hayden and Fin are dressed and sitting up, but not awake yet. 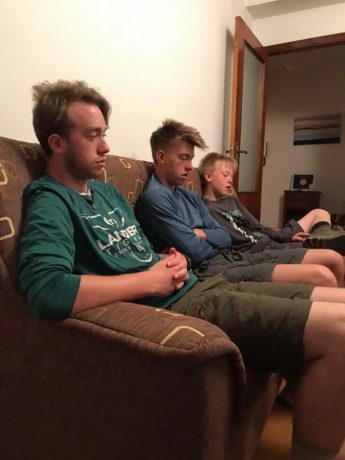 I am overcome with gratitude for these boys and their day after day of pilgrimage. I know they’d rather be sleeping in and doing something other than walking every single day, yet they haven’t complained and they have been a joy on the trail. 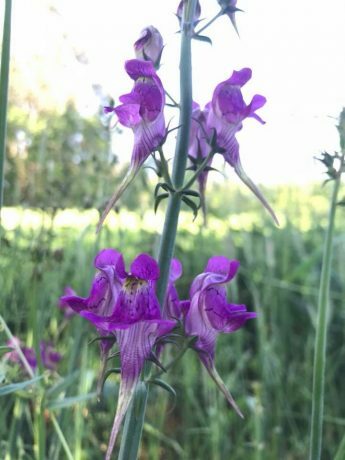 My favorite flower on the Camino, and one that is common and is a reliable “pick me up” – Foxglove. 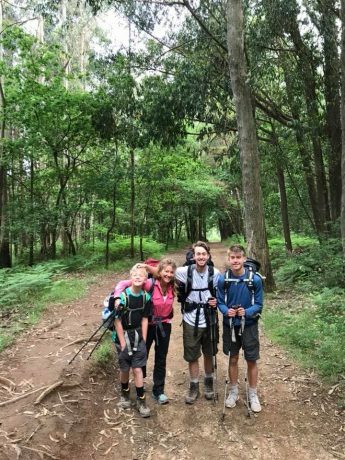 We’ve seen it most every day since starting our trek about 150 miles ago… As a matter of fact, THIS VIEW — of my boys in front of us on The Way, with flowers alongside the path –– has been a constant. I know–it looks like about 49 other photos I’ve posted. But please note the Camino marker at right and the red spray-painted note on it. That’s why I hurried and got my camera out to capture this one this morning. This sorta looks like what I imagine Heaven to look like… If you look closely you’ll see Jerry’s and my greatest blessings in the center of the photo. We have loved, and petted, so many dogs along the Camino de Santiago. Every little village we have walked through usually has 1 or 11 dogs. Fin, especially, looks for them. We really miss our Buddy. 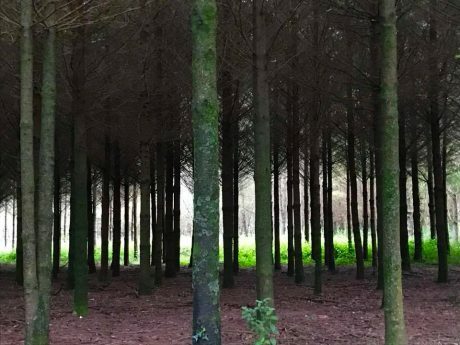 For a stretch, we walked by this forest of tall trees and no deadfall on the ground. The lighting was beautiful. We stood and looked at it for some minutes. Our Hayden! He LOVES basketball and so, naturally, we had to get a photo of him when we found this basketball hoop on the Camino de Santiago. 🙂 (Hayden has huge blisters on his heels, but you would never know it by the speed and form of his hiking…) P.S. 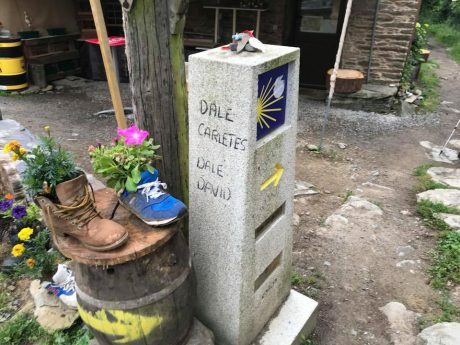 I love the “Love Wins” message on the camino marker at left. 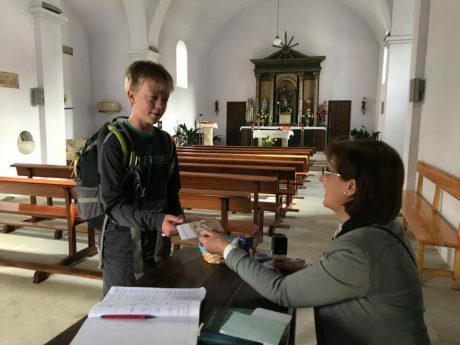 Our Fin, who received numerous compliments for walking the Camino at his young age. About as happy as I can get… walking/hiking with my boys and Jerry in a beautiful place, making memories. 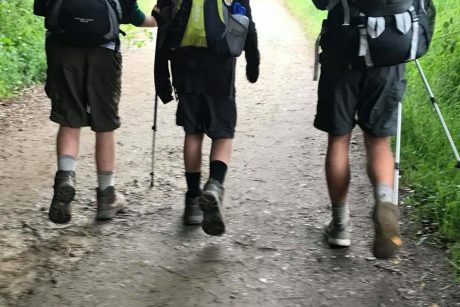 The Johnson boys’ hiker calves. This is such a common view for Jerry and I, who fight to keep up. 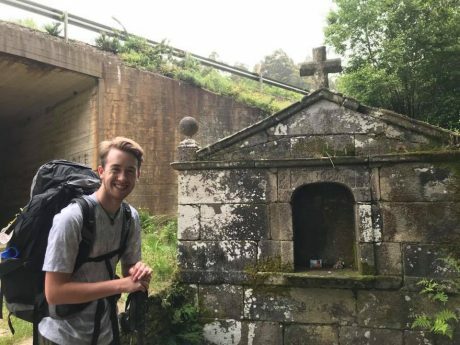 Today was Day 8 of our pilgrimage on the Camino de Santiago. It was a challenging day, and I am happy to report, it went wonderfully! Today’s walk was 18 miles. We started a little earlier than normal, (at 6:30am) and, as is always my experience when we start the day early, it was a brilliant idea. 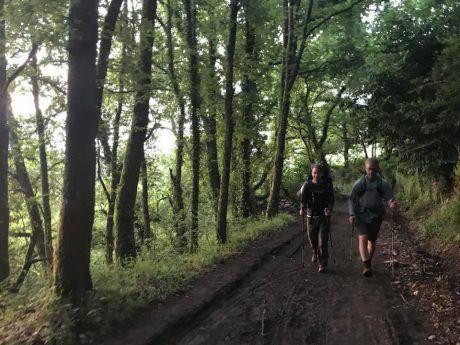 We had most of the first 5 miles of today’s walk to ourselves, which is pretty amazing, considering we’re on the French Way, the most popular route of the Camino de Santiago. 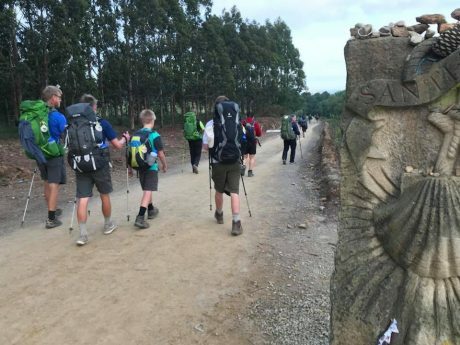 We’re closing in on the “finish” — Santiago – so there are many more pilgrims sharing the trail with us now. The trails and terrain today were fantastic. We didn’t really know what to expect, but I think it’s safe to say we were all pleasantly surprised. For the lion’s share of today’s walk, we enjoyed damp dirt trails that took us through lush green forests that provided a canopy (shade and protection from the hot sun), and we were surrounded by ferns and flowers for much of the route. The boys did a phenomenal job. Most of us have challenges we’re dealing with by now. 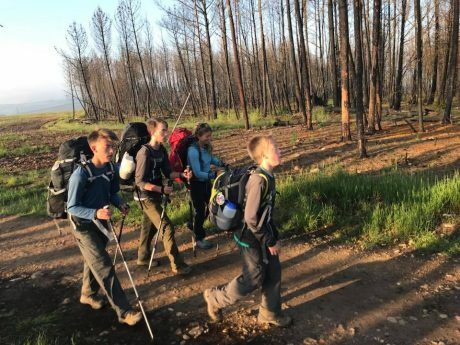 We have been walking with backpacks on for miles, day after day, after all, including a significant amount of it on sidewalks and/or hard surfaces. Wolf has a sore ankle, and has been battling allergies and a head cold since the start of our trip. He coughed most of last night and as a result, got little sleep. Hayden has a huge blister on each of his heels, which he popped with a sterile needle last night and we bandaged for today’s hike. The blisters are huge, and I know from personal “blistered feet” experience, that every one of his 45,000 steps today was painful. He also had sore achilles tendons early on, but fortunately those seem to be almost back to normal. Fin, well he’s 11 years old, and we’ve been walking for miles and miles, day after day. 🙂 As for Jerry, he is in great shape, and suffering no challenges other than having the role of Ring Leader for our Circus, and having to deal with all that job description entails. He deserves something significant for all of his efforts; I’m brainstorming that. 🙂 The boys were total CHAMPS today. They were in great spirits, and didn’t complain. They are great trail company and fun to be around. Jerry and I truly enjoy (most of! haha) our time with them. Sometimes we all hike together, but in silence. Other times some are talking and others aren’t. Other times we’re all in a conversation. Sometimes we’re hiking in a group, other times we’re all spread out. It doesn’t matter, and it always seems to be just right. Today, we met more interesting pilgrims! First of all, we met Jeff, from Reno, Nevada, who is a NOLS graduate. In fact, he has taken 3 NOLS courses. 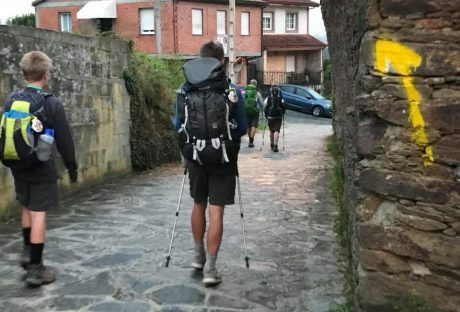 He is walking the entire Camino, as a pilgrimage, in part for his Catholic faith. He shared with me that he recently left his job of 10 years where he worked in energy efficiency for data companies like Google. Now, he’s got his own company that offers consulting in those areas, and he’s also doing work for the Catholic Church. He’s about to turn 40. He’s been walking about 50 kilometers a day. He says it has been a wonderful experience. He keeps thinking of the suffering the earliest pilgrims must have endured in their pilgrimages “They would leave their farm with nothing.” In those days, he said, if you got a blister and it got infected, you died. He says he has thought a lot about their suffering as he has followed in their historic footsteps. He is excited to meet his wife and two children at the end, in Santiago, in a couple of days, to celebrate. He is the first person we have met that knows where Lander, WY, is, and that has some mutual connections. I also met Pierre, who is 74, and who is walking the Camino for his third time! 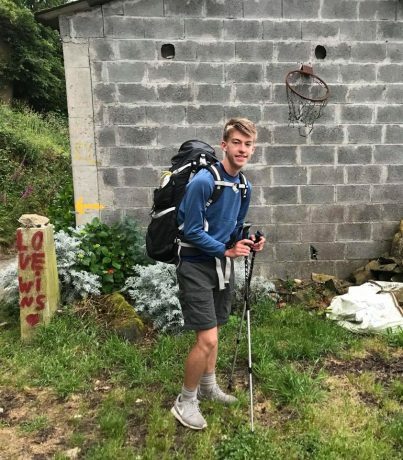 The first time he walked it, he walked from his home in France, and his total pilgrimage from his home to Santiago was 1,800 kilometers! As we approached him on the trail this morning, one of our sons guessed he might be Bernie Sanders, but as it turned out, he wasn’t Bernie. (See the last photo in my photos to see Pierre.) I walked with Pierre for about a quarter-mile before he kissed me on each cheek, and yelled farewell. I also met a woman who is from Madrid who is walking the Camino with her 78-year-old father. She knew little English, and I am not great at speaking Spanish, so we struggled in our conversation, although it was a very pleasant effort. She did ask if Jerry and the boys were mine (pointing ahead to my guys, she asked “Es Tu Familia? Los chicos? Cuatro?” and when I said, “Si! she exclaimed, ”You are a saint!” It was another unforgettable day, full of meaning, and rich, rich, rich time spent as a family. We have two days left of walking before we arrive in Santiago on Saturday. Thank you so much for your thoughts, and for following along on our journey. It means a lot to us! 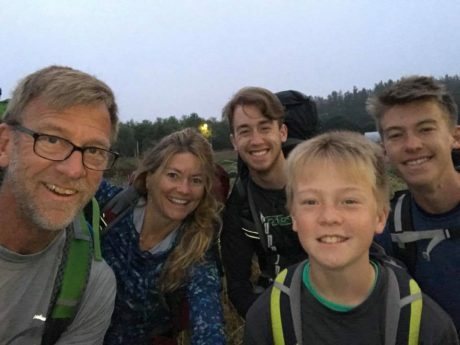 Family selfie at our 6:30am start this morning, leaving Palas de Rei, for Arzua. The trail for most of today’s route was beautiful and green. A trail marker with someone’s expired boots on it. We appreciated the bouquet. Our youngest son, Fin, gets our “Credencials” stamped in a church along The Way today. 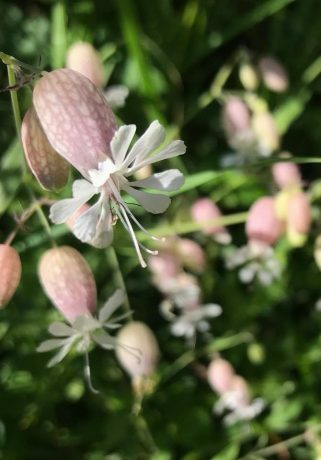 A flower I saw for the first time on our pilgrimage. Another flower I saw for the first time on our pilgrimage. Son Wolf chose a pizza today. 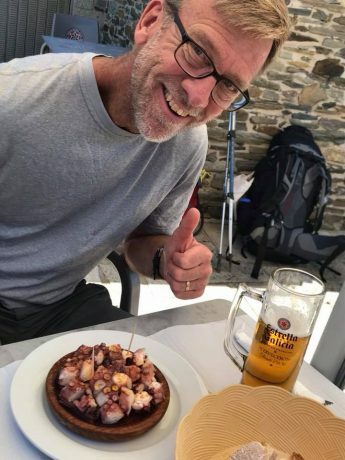 My husband, Jerry, happy with his choice of Octopus and beer. Hayden has giant blisters that we popped last night on both heels. He walked hard and without complaint today. I am so proud of him, and we all appreciated his valiant effort! FitBit reports we each walked about 45,000 steps today, and I know from personal foot blister experience that Hayden had pain with every one of those steps. 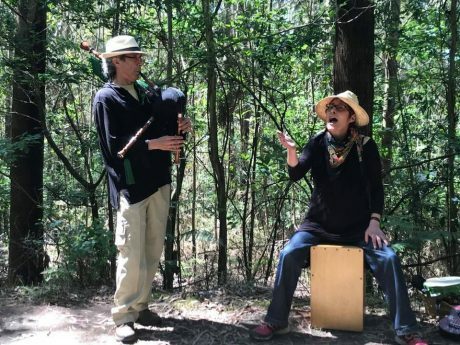 We did not expect to have live music on the trail, but that’s what we got! As we turned a corner near the end of today’s walk, we were greeted by these wonderful musicians. 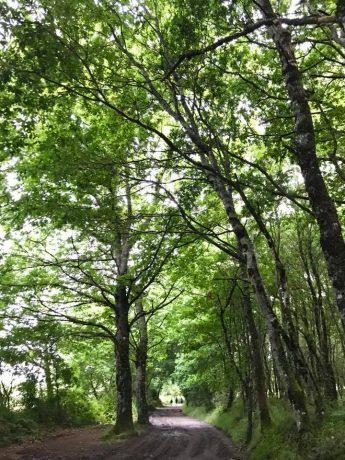 After we crossed the Miño River and started up a hill, the sun came up and lit the forest and trail with a bright golden glow. Sunrise is my favorite time of day, and this was our first morning to have a clear sky and a notable sunrise. This made me so happy! Today’s hike was 15 miles, and we shared the trail with many pilgrims. 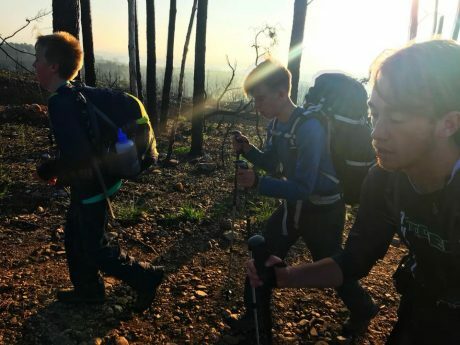 About 4 miles in, at the top/end of a long uphill, the boys pulled to the side of the trail and sat on their backpacks for a KitKat break, while Jerry and I took a 400-meter roundtrip detour to check out the remains of the castromajor Romanesque church of Santa Maria, which was inhabited from the 4th century BCE until the start of the Roman occupation. 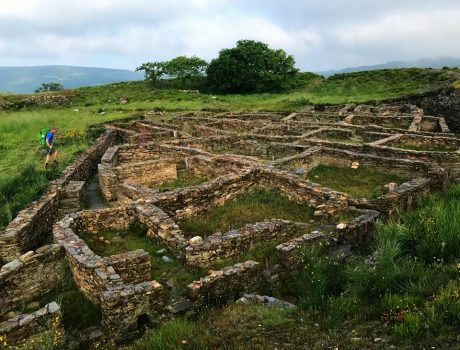 After that quick exploration we walked through rolling farm fields, and several little villages until arriving at Palas de Rea, our destination for the night. We are really getting our routine down by now. Have I mentioned lately how I love this current Camino lifestyle?!! Here’s how it goes: We start hiking around 6:45am. We always huddle and share a custom prayer at the start of each hike. Sometimes we add an additional exercise or intention for each of us to provide more purpose t the day’s hike. 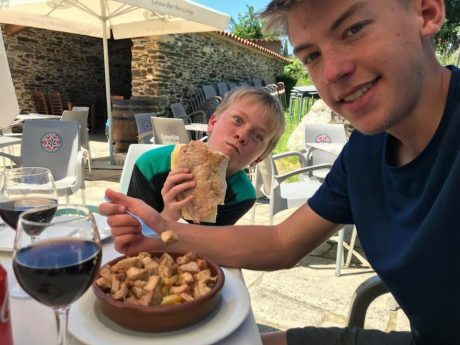 Then, after we’ve hiked 10 miles or so, the boys take on the leadership to find an albergue that serves soda pops for them, and sangrias and/or “vino tinto” for us, and fortunately, they are always successful in their hunt. 🙂 We then proceed to take a much-needed break with our loads off and our feet up while hydrating on these particular beverages. Then we walk again for some miles until we’re about 1-3 miles from our final destination for the day, at which we point we find a place that is making a serving delicious food, and we enjoy a hearty lunch. Depending on the mileage for the day, we usually arrive to our town or village between 1:30-2:30pm. The boys take their shoes and socks off and plunk down for a nap or some “Privs” (Netflix, games, etc. ), and Jerry and I go find a sangria or some wine. Siestas are for reals here in Spain, so most shops, etc., are closed from 3-5pm. We are totally in support of Siestas, so we do our part to honor the tradition after we’ve had our beverage. LOL. Eventually, everyone gets cleaned up and we set out for hopefully not many steps to find a hearty dinner. BTW, the “peregrino (pilgrim) menu” in most of these village restaurants include two super-sized courses, plus a dessert (usually tira misu, flan or “Santiago cake,” and a beverage, all for 8-9 euros/$10USD per person.) 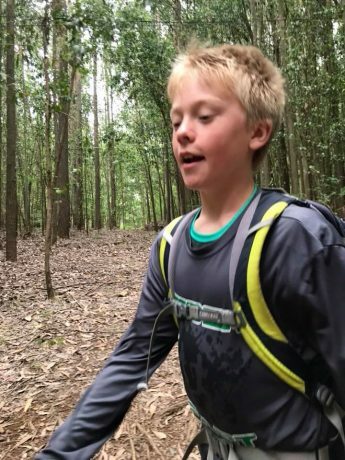 It’s crazy delicious, and a truckload of food, which is critical when you have three growing boys who are hiking many miles every day and can’t get enough food. Then, after dinner, we “waddle” back to our motel or flat, and we’re in bed by 10pm. Then, rinse and repeat. Today I met two wonderful pilgrims with great stories. Anna Lou, 25, is originally from Mexico, but is a professor of public speaking at a college in Texas. 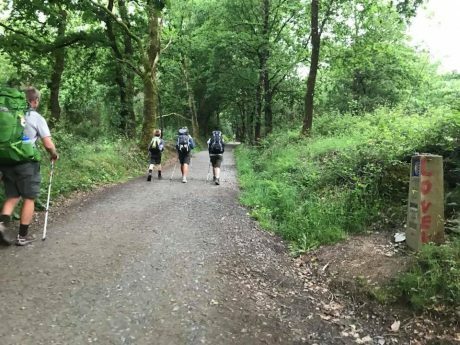 She is walking the Camino to celebrate her 25th birthday. She said she is having a wonderful experience. She said her Dad did the Camino, on a bike, some years ago, and that inspired her to walk the Camino. She also shared that she read a Thesis that a man wrote that compared pilgrims of early times with pilgrims of modern times. She told me the difference between a crusade and a pilgrimage is that a crusade takes something or takes something back, and a pilgrimage offers something. 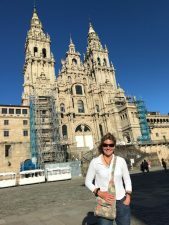 She said everyone asks (myself included) what pilgrims are looking to gain from walking the Camino, and she’s been asking herself, instead, what can she offer the Camino? We had a great conversation about how kindness begets kindness, and I was so glad we got acquainted. We’re going to keep in touch, and I look forward to it. (I bet we’ll be celebrating in Santiago when she is, and I hope our paths cross again there this weekend.) I also met Celine, from Lebanon. Celine is 27, and was inspired to walk the Camino after reading The Pilgrimage, by Paulo Coelho. And, she added she is searching for herself. When I asked her if she’s found herself yet, she said, “I’m not sure.” We both agreed that transformation is so often occurs over time, and that changes and insights can be “unpacked” for weeks, months and even years after return from an experience like a pilgrimage. Celine and Anna Lou were walking together when I met them, and at first, I thought they were sisters. They both have been walking individually for weeks, but met each other three days ago and became fast friends. We have 3 days of walking left. Our son, Hayden, unfortunately has two giant blisters on his heel. He is such a champ. He walks and never complains despite the pain his blisters are surely causing him. We are more proud of our sons than we can say. 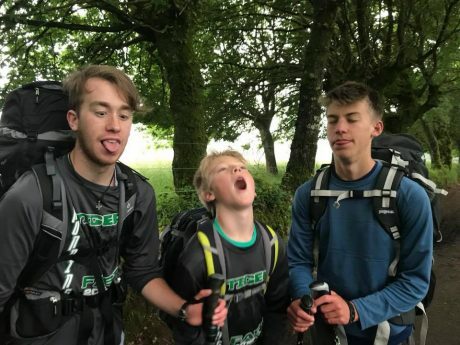 Walking day after day for 160 miles and several days was not their idea and would not have been their first pick. But they’re doing wonderfully and we’re having a meaningful time on this pilgrimage. Thank you for following along with us. We very much appreciate your thoughts and support! We watched the sunrise at the start of today’s walk. Jerry, checking out the castromajor Romanesque church of Santa Maria, which was inhabited from the 4th century BCE until the start of the Roman occupation. Posing with my boys, with some sheep in the background. 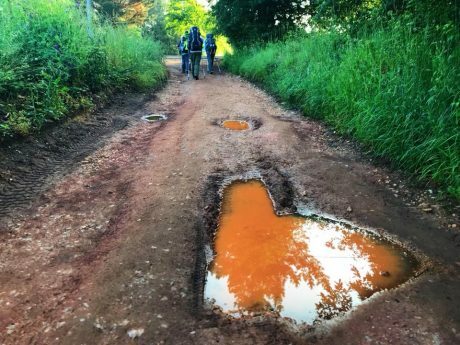 Heart puddle reflections, and my guys up ahead. I love walking with my family.